We are so excited to join the Chesterton community! Opening in 2019, StoryPoint Chesterton will make its debut, offering independent living and enhanced living options. Throughout all of our senior living communities, we do our best to make each moment of each day something to remember. We know it’s the little things in life. No matter what we do, large or small, our goal is to make sure our residents Shine. Everyday. A central meeting place, our main lobby will be the perfect place to chat with friends, relax with a book or simply enjoy the warmth of the fireplace. During morning hours, residents are invited to grab a quick snack, a refreshing cup of coffee or to just enjoy our baby grand piano! Able to seat up to 75 people, this area will be ideal for events, movie nights, lectures and celebrations. An excellent place to relax with a book, do the crossword or meet friends for a board game, this common area will offer computers and printers available anytime! Casual dining plus all the excitement of a sports bar, this cozy pub will offer residents and guests a “night out” experience right within the community! There’s sure to be something to satisfy every any taste bud at the Prime Thyme dining room! Our Executive Chef will prepare numerous menu items each day from fresh, locally-sourced ingredients. Available for gatherings of up to 10 people, our private dining room will be available for residents and guests. For residents in the mood to be pampered, we’ll have our very own licensed, professional massage therapist on site. With three styling stations and three drying chairs, our beauty and barber shop will provide manicures, pedicures and hair services! There’s nothing better than a home cooked meal, except maybe the joy that comes from sharing it. At StoryPoint Chesterton, we’ll employ our very own Executive Chef to create dynamic, ever-changing options and a dining experience unlike any other. At StoryPoint Chesterton, we know that one size does not fit all. We take the time to get to know our residents to design unique activities catered to their specific interests. Have a favorite hobby or craft? We’d love to hear it and create an event for all our residents to enjoy. Want To Know More About StoryPoint Chesterton? 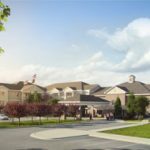 StoryPoint, a company in the Midwest that specializes in living communities for seniors, is looking to build a 162-unit development on the property located between the Chesterton Medical Center clinic and Addison Pointe Health and Rehab Center on Dickinson Rd. Fill out the form below to learn more about our newest community. Our expert Community Specialists would be more than happy to answer any and all of your questions.